This area, in the late 19th century and for the first half of the 20th, was a cutting garden and glasshouse area for producing cut flowers for the Jay house and to sell to New York City hotels. The concrete foundations are what survive of the historic glasshouses. 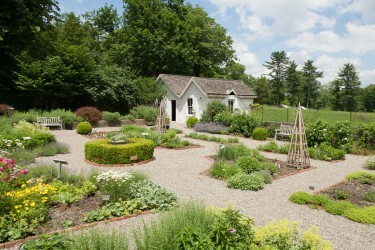 The garden took its present form in the early 1990s when the New York Chapter of the Herb Society of America implemented a design by Page Dickey, laying out the garden in the style of a 17th-century English knot garden. It is planted with a wide variety of herbs that were grown historically for various purposes: cooking, dyeing, fragrance, medicinal use, and pest repellent. The Herb Society’s members continue to care for this garden today.